Raide-Jokeri light rail line will connect the cities of Helsinki and Espoo. Image courtesy of Ramboll Group. Raide-Jokeri line will be designed by a consortium of Ramboll Finland, Sito and VR Track. Image courtesy of Ramboll Group. The total track length of the line between Helsinki and Espoo will be 25km. Image courtesy of Ramboll Group. Transtech’s Artic XL trams will run on the Raide-Jokeri light rail line. Image courtesy of HSL. Raide-Jokeri (Rail Jokeri) is a proposed dual-track, high-speed light rail transit (LRT) project, which will to be built to serve the growing number of passengers between two of Finland’s biggest cities, Helsinki and Espoo. The number of passengers travelling on the Helsinki-Espoo route is currently forecast to increase to 140,000 a day by 2040. The project is being implemented on a collaborative basis by the cities of Helsinki and Espoo, and is scheduled to be operational from early 2020. It is expected to cut the travel time between the two cities to roughly 60 minutes. A feasibility study related to the development was conducted in February 2016, while the proposed route was approved by the Helsinki City Board and the City of Espoo in June the same year. The development phase will commence in November 2017 and continue through December 2018. It will involve the preparation of a development and project implementation plans, as well as technical solutions. The implementation phase is set to begin in 2019 and will encompass the LRT’s construction, management and maintenance. Rail Jokeri is expected to serve approximately 100,000 passengers a day upon completion. The proposed Raide-Jokeri light rail line will run from the Itäkeskus district in the eastern part of Helsinki to the Keilaniemi district in the south-eastern region of Espoo. It will also pass through a number of stations such as Keilaniemi, Otaniemi, Leppävaara, Huopalahti, Oulunkylä, Viikki Science Park and Itäkeskus. The total track length of the line will be 25km, including 16km in the Helsinki region, with the remaining stretch located in Espoo. The route will include 33 stations, with an average distance of 800m between consecutive stations. It will also feature various exchange stations, connections and two depots. 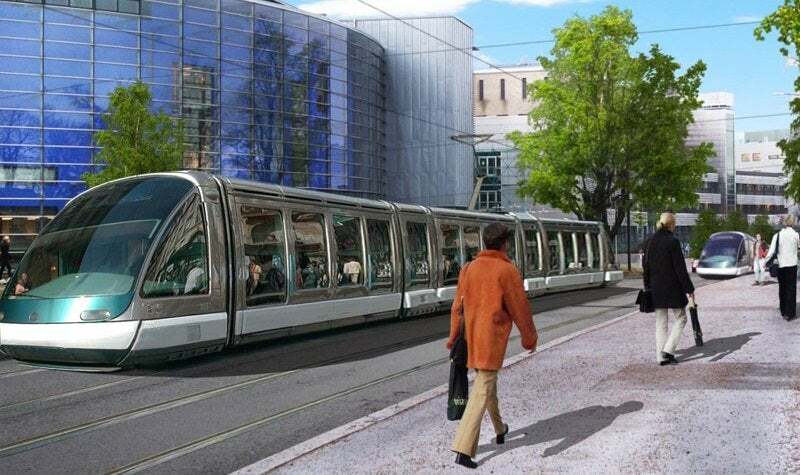 The Raide-Jokeri LRT will be built at a cost of €280m ($300m). An estimated €108m ($116m) will be spent for tram units, while the tram depots will cost an additional €64m ($68.7m). The European Investment Bank is expected to lend up to €200m ($210m) to support the initiative. The state government will also offer subsidies to the project, covering up to 30% of the construction costs up to a maximum of €84m ($90.2m). Helsinki City Transport (HKL) signed a letter of intent with Škoda Transportation subsidiary Finnish Transtech to purchase 29 Artic XL air-conditioned light rail vehicles for the Raide-Joker project in December 2016. The contract agreement was signed in 2017 and the delivery of the first prototype is scheduled for mid-2019. The 35m-long advanced Artic XL vehicle is based on HKL’s latest Artic tram and has a service life of 40 years. It can carry 76 seated and up to 180 standing passengers. The trams feature a low-floor design and side doors, and have been designed to provide passengers with a comfortable and environmentally friendly mobility option. The Raide-Joker light rail line is intended to replace the existing busiest trunk bus line 550 between Helsinki and Espoo, which currently serves approximately 40,000 people a day. "The project is being implemented on a collaborative basis by the cities of Helsinki and Espoo, and is scheduled to be operational from early 2020." The railway line can carry three times more passengers than bus line 550, while maximising comfort and reliability. The cities of Helsinki and Espoo have formed a subscriber organisation to design and implement the development. Ramboll developed a conceptual design for the rail line in 2015 in collaboration with WSP Finland. The subscriber organisation selected a consortium comprising Ramboll Finland, Sito and VR Track to design the project in June 2017. A team consisting of Espoo City Center, Urban Environment Division of the City of Helsinki, and Espoo City Planning Center will be responsible for overseeing project planning, street planning, transport planning and segregation of sites. Beginning with Deutsche Eisenbahn-Consulting GmbH (DE-Consult) and later under the name DB International, the experts of Deutsche Bahn have now been working worldwide for more than 50 years to find optimum solutions in the fields of infrastructure, mobility and transport and to support project implementation. COWI is a leading international consulting group and specialist in railway engineering. Our highly professional staff are committed to developing efficient and innovative solutions within multidisciplinary railway and infrastructure projects.